Boundless Journeys Canadian Rockies hiking guide, Mary Jane Hammond, recently took a hiking trip through the mountains of southern Spain. Here’s a small sampling of the joys of hiking in this region. It is late October and we have extended our Canadian summer thanks to Andalucia’s ideal Mediterranean climate. Our journey over the next few weeks will be on foot, but before tying up our hiking boots we succumb to the lure of Sevilla and Grenada, two of Spain’s great cities. Past glories are evident in history, art and architecture; we get a taste of the present as we watch flamenco and witness the locals on their evening paseo, enjoying camaraderie under the stars that this enviable climate bestows. We are fortified for our adventure in the mountains. 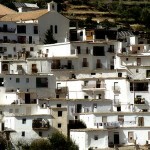 The plan is to hike the hilltop villages from Los Berchules to Trevelez, and on to Capiliera in the Alpjuarras, a remote and rugged region of the Sierra Nevada, southeast of Grenada. We quickly discover that our maps and the region’s infrequent signs are insufficient for easy route finding. Fortunately for us, our English-speaking hosts at our cozy Los Berchules inn point us in the right direction. The ancient Berber trails take us through wild and magnificent country, free of tourists or locals for that matter. A feast for foragers and hungry hikers, as we walk we gather fresh figs, apples, almonds, walnuts, and oranges to supplement our picnic lunches of delicious Trevelez jamon, (ham famous throughout Spain for being naturally cured), flavorful Manchego cheese and fresh-baked bread. Cloudless blue skies give way to distant mountain views, the valley bottom far below us. Each day’s sighting of our destination of a whitewashed Moorish town, perched high on a hilltop, triggers exhilaration and a flurry of photos. At day’s end, we relax in the village square with a cold beer, soaking up those last warm rays of sunshine, muy contento. 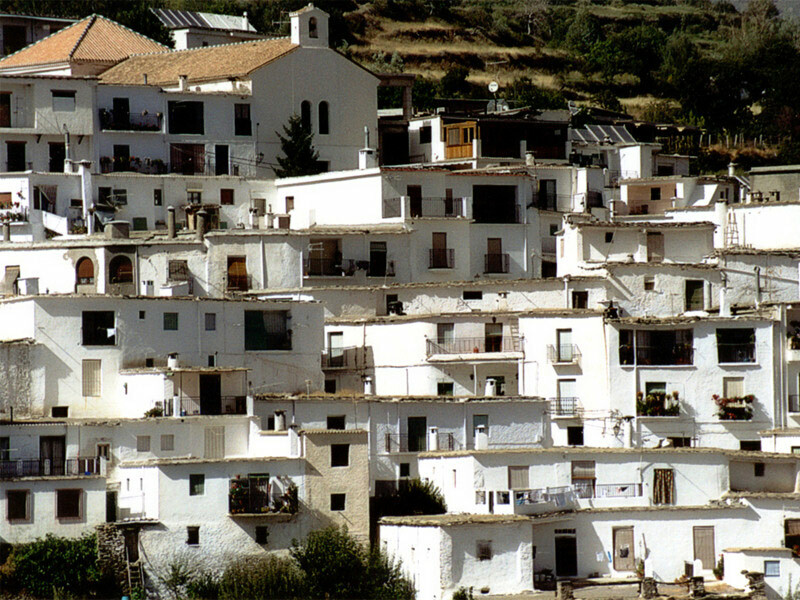 Join Boundless Journeys and experience these remote hilltop villages of the Alpujarras on our Spain: Andalucia & the Alpujarras trips during both spring and fall months.